12/9, 46/37, cloudy w/rain, NW25-30>35(gale warning)>N15-20 - Dobbs and I slept well, warm and dry in the V-berth while rain fell on deck. The portlight in the head was leaking at the aft corner so, this evening, I removed the gasket and screen, cleaned them, and put it back together. Usually that takes care of it - dirt gets in between the various parts and disturbs the seal. The breeze was still NE this morning and so, while Grace would occasionally heel sharply to starboard, the overall movement wasn’t bad. I was careful not to set any dishes at the edge of the table. We stayed inside all morning, reading and writing. Around 11am, the wind backed to the NW and filled in strong. The high water of the flooded coastline combined with wind-against-tide to give us an energetic see(or perhaps sea? )-sawing ride at the dock. Dobbs added two extra dock lines to further limit Grace’s movement and we did our best to ignore it. By 2pm, the wind was toning down a notch or two and the chop was settling. At 2:30pm we borrowed the car to visit a local historic cemetery - the Zion Cemetery and Baynard Mausoleum. It is the site of the first formal church on Hilton Head Island (long since destroyed) and the oldest standing structure on the island. The grounds are in the process of being researched and plots are being restored - what appeared to be several unmarked graves were outlined in yellow tape. The history is interesting - you can read about it online: Baynard Mausoleum and Zion Cemetery: Preserving Island History (Hilton Head Monthly, September 2016). That’s the marina courtesy car in the parking lot. The cemetery is situated off to the left. I found it challenging to take a panoramic photo with the right “feel”, since the cemetery is right off the highway, with commerce across the road. Here, I’m facing the marsh. 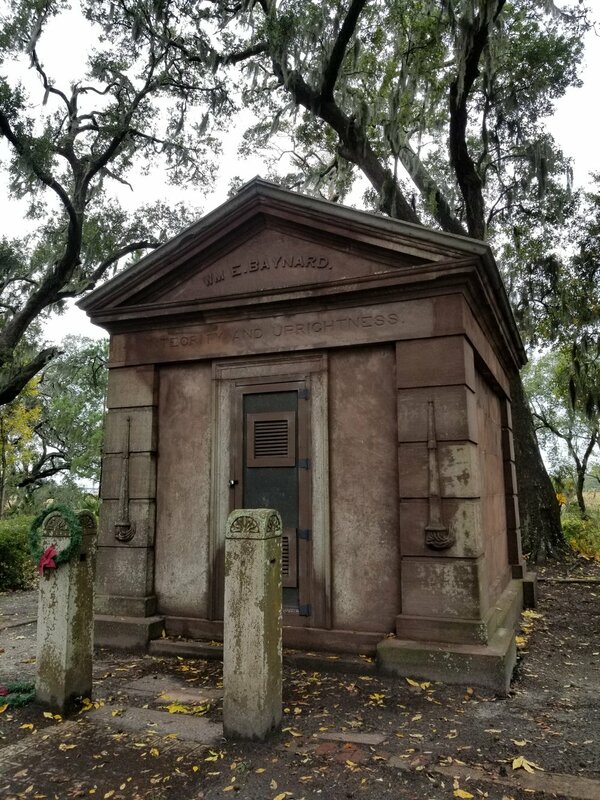 The Baynard Mausoleum - the oldest standing structure on Hilton Head Island. Note that the torches on the front of the building are upside down to symbolize a life cut short - Baynard died at 49 in 1849. Click on this photo to see a 1-minute video about the restoration of the bluestone slab roof. Mary Irvine’s headstone is being absorbed by a live oak. Looking more carefully, Mary and her husband William Irvine were buried side-by-side - these are their footstones. The live oak grows from where there bodies rest together. A touching living memorial. In this photo you can see the yellow tape marking out areas that appear to be partially marked and unmarked graves. On the way over, we missed the cemetery entrance and had to go into Chaplin Park to turn around, so we took a couple minutes to walk out to the beach. We can only imagine what it looked and sounded like this morning, at the height of the gale. Now, it was remarkably calm. We did note breakers far out, suggesting that the shoreline receives protection from heavy surf. I see tonight, looking at a chart, that the water is mostly about 10’ deep for five miles off the beach. The air was chilly, and we were glad to get back to Grace to warm up. I took Murphy for a quick half-hour walk (his resolve weakens like mine when it’s cold outside). For dinner, I made roasted pepper curry with the garbanzos and coconut milk left over from a few days ago.